Node.js includes a minimal set of functionality in the core runtime. Developers often use 3rd party modules to provide additional functionality when developing a Node.js application. In this tutorial you will create a new application using the Express module, which provides an MVC framework for creating Node.js web applications. To successfully complete this section, you must have a working installation of Node.js and the Azure SDK for Node.js for your platform. If you are using Mac or Linux, install Node.js from http://nodejs.org. 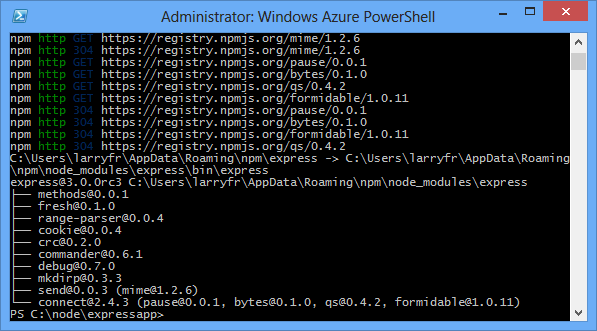 The Windows installer already includes Node.js. From the Start Menu or Start Screen, search for Windows PowerShell. Finally, right-click Windows PowerShell and select Run As Administrator. 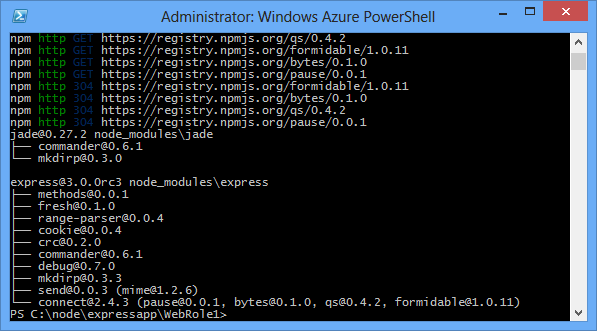 By default, Add-AzureNodeWebRole uses an older version of Node.js. The Set-AzureServiceProjectRole statement above instructs Azure to use v0.10.21 of Node. Note the parameters are case-sensitive. You can verify the correct version of Node.js has been selected by checking the engines property in WebRole1\package.json. The output of the npm command should look similar to the result below. You will be prompted to overwrite your earlier application. Enter y or yes to continue. Express will generate the app.js file and a folder structure for building your application. Use the following command to copy the bin/www file to server.js. This is so the cloud service can find the entry point for this application. 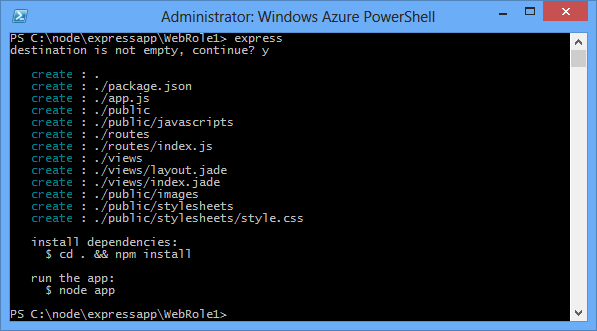 After this command completes, you should have a server.js file in the WebRole1 directory. Modify the server.js to remove one of the '.' characters from the following line. After making this modification, the line should appear as follows. This change is required since we moved the file (formerly bin/www,) to the same directory as the app file being required. After making this change, save the server.js file. Now modify the view to display the message "Welcome to Express in Azure". 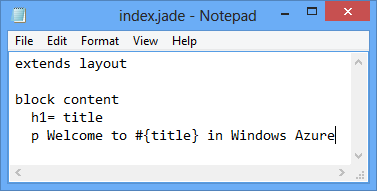 Jade is the default view engine used by Express applications. For more information on the Jade view engine, see http://jade-lang.com. Modify the last line of text by appending in Azure. 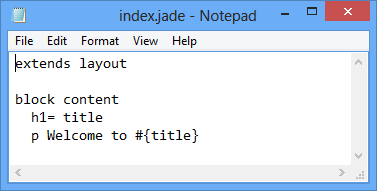 Save the file and exit Notepad. Refresh your browser and you will see your changes. After testing the application, use the Stop-AzureEmulator cmdlet to stop the emulator. Once the deployment operation completes, your browser will open and display the web page. For more information, see the Node.js Developer Center.